The PAC 64 is a somewhat ubiquitous luggable, built in the same chassis as other Dolch products and some lesser known brands. The PAC 64 is a baby-AT system with a Pentium CPU.Famous (among enthusiasts) for their Cherry MX-switch keyboards, Dolch portable computers, often configured as network analyzers, can be found for tremendous amounts of money when the keyboard is present, and for next to nothing when the keyboard has already been pillaged by an aforementioned enthusiast. 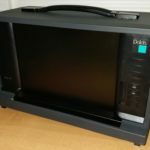 This is to be expected; the average Socket 7 computer was chucked to the curb over a decade ago, and the only things that kept these computers from that fate was the novelty value and functionality of their form factor, and specialized applications. Internally, although the power supply is of dimensions unique to this and related luggables, everything is pretty normal PC stuff from the baby-AT era. Notably, my PAC 64 has an AI5TV-1.03 motherboard, which provides pretty standard IO options for its time. 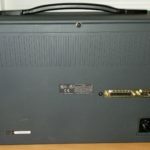 Things like the integrated PS/2 and USB 1.1 ports, which the motherboard is equipped for, were never exposed on the chassis as they weren’t relevant to the use of the machine. I received this unit minus the keyboard, as its owner before me had purchased it for the keyboard and had no use for the remainder of it. 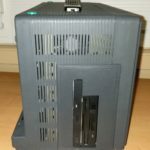 Photos show my unit with a traditional heatsink/fan assembly; originally, the Dolch systems shipped with a small flat heatsink that allows for full-length cards to be installed in any slot without interfering with the HSF. More interior photos will be follow in a teardown post later. RAM: 128MB (4x 32MB) 72-pin EDO, upgraded from 64MB as received. MB alternatively supports one SDRAM DIMM. Video: uses a special Chips & Technologies 65548 PCI card with integrated interface for the LCD panel. This card may have been custom produced for Dolch as the part number printed on it follows their numbering convention: 21-1001-0219 Rev B. Input: none included with mine; normally includes a keyboard which attaches to the front of the chassis forming a cover for the screen. This keyboard connects via a modular jack which is internally wired to the AT keyboard socket on the motherboard. Expansion, IO: 4x PCI, 3x 16-bit ISA, 2x DE9 serial, DB25 parallel, AT keyboard internally wired to 4p4c modular jack on front of chassis. Original specifications as-shipped from manufacturer are not known; upgrades noted where information available. 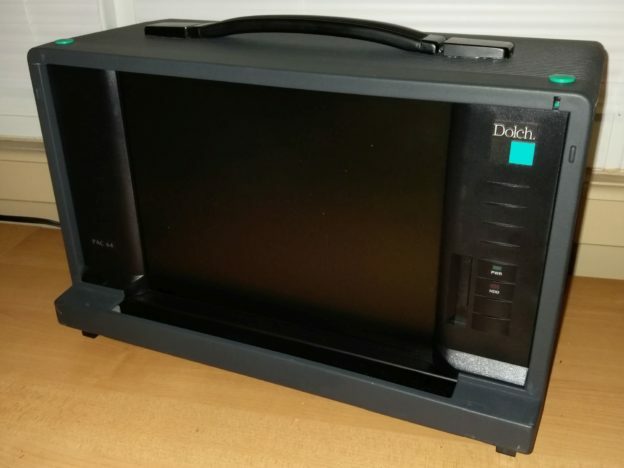 I have a dolch pac 64 unit that I would like to sell to someone who can appreciate it. I have the original keyboard as well. Can you steer me in the right direction? Any info you could provide will be greatly appreciated! First, thanks for your interest in this page, and also for wanting to keep the unit as-original. 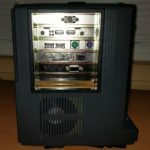 2 – the group of enthusiasts mentioned above is so much bigger, more vocal, and more willing to throw money at their hobby, versus the group of enthusiasts who care about a 90s computer, that there is a negative amount of demand for the rest of the computer. That is, there are people willing to spend truly large amounts of money to buy these, complete, with the intent of throwing away the computer immediately upon receipt. I cannot offer any tips other than to decline to complete the sale to any party who asks about buying the keyboard separately. If at any time they have asked this question, it means with a high degree of certainty that it’s the only part they are after. But as described above, there is no guaranteed way to keep it out of the hands of someone who might have the same intent anyway. If I did not already have mine, absent of a keyboard as it may be, I would certainly be interested myself. However due to space concerns I’d basically be e-wasting mine after getting the new one and that isn’t really ideal. I do have a friend who may be interested and will float it by him. I have your email address from when you submitted the comment and will put him in touch if he’s interested.